Inventory We are a resale marketplace, not a box office or venue. Ticket prices may exceed face value. This site is not owned by Toyota Stadium . Toyota Stadium, formerly FC Dallas Stadium, is home to the Major League Soccer's own FC Dallas. 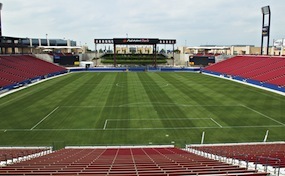 The Toyota Stadium box office is located at 9200 World Cup Way in Frisco, Texas. The venue opened on August 6, 2005 at a total construction cost of $80 million. Toyota Stadium has a seating capacity of 21,193 and also has the capability of converting to concert configurations to draw the touring summer acts. Some of the most memorable Toyota Stadium tickets have included the 2005 MLS Cup, 2006 MLS Cup, Ozzfest, and international matches like the one that drew Inter Milan. Toyota.StadiumFrisco.com is an independently owned and operated site that specializes in all sales in the secondary market. We are not currently affiliated with any primary box office, venue, or official supplier. Tickets may be above or below face value and will fluctuate in price with the market. To purchase tickets to all Toyota Stadium events simply pick up your phone and call our operators at anytime or click on the event of interest and follow the steps online through the checkout.